Cardinal Burke was included among the members of the highest regular court of the Vatican, the Tribunal of the Apostolic Signatura, in a surprise move by Pope Francis made public today. Others also named today were Cardinals Vallini and Menichelli, and Archbishops Frans Daneels and Hendriks. Why would the Pope appoint Burke as a minor member with an almost advisory role to the same Court from which he had been summarily dismissed by Francis himself from the position of Prefect (President, Chief Judge) just three years ago? The same Burke absolutely humiliated in his position as Prelate to the Sovereign Military Order of Malta? It is a classic move. Not of Catholicity, but of Italian power politics. Congratulations are in order both to the Cardinal and, in particular, to His Holiness. Molto bene, Santità!... Magnifico! The Filial Correction published last Sunday has attracted more support than I, as a signatory, had dared to hope. Additional signatures from pastors and academics have been submitted by the score; a petition in support has been signed by more than 10,000 people and counting; and it has been reported widely in the secular as well as the Catholic press. It is difficult to know where to start on this one: the hypocrisy or the risible accusations of heresy against the Holy Father. I’ll go with hypocrisy. Hypocrisy is the state of those whose beliefs do not correspond with their words, particularly when they wish others to uphold standards in which they do not believe. Does Walford seriously imagine that the signatories are insincere? What on earth is their motivation, Mr Walford, if they don’t think their claims are even true? It is difficult to avoid the conclusion that Walford does not actually believe that the signatories are hypocrites; he just likes the sound of the word. The accusation, in fact, is quite literally hypocritical, as he insincerely accuses others of making insincere accusations. The new guardian of Catholic "orthodoxy", the semper-heretical "National Catholic Reporter", calls us out for "hypocrisy" for our support for the "Filial Correction". The charge is related to our post from 2012 in which, during the height of the intense persecution of Pope Benedict XVI -- persecution by the media, by many churchmen, by that self-entitled "Mafia" who wanted Joseph Ratzinger gone (and succeeded in it) and used dirty hands inside the Vatican to leak information to the media unceasingly -- we asked for unity and respect for the Pope using the words of Pope Saint Pius X during his life-or-death struggle against Modernism. "Love the Pope," Saint Pius X urged, as rebellious infiltrators did all they could to stifle the effects of Pascendi in the Pope's efforts to "instaurare omnia in Christo." 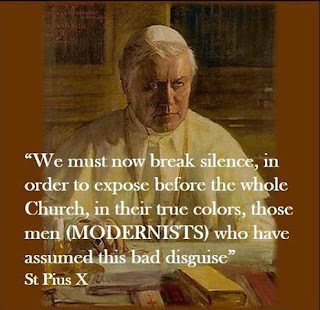 We know that Saint Pius X succeeded only partially in expelling the vipers and snakes of Modernism from the dens in which they were crawling. The Church had a half-century of internal peace, but Pius XII already knew that the struggle was coming to an epochal apex when he did all he could to beatify and canonize Pope Sarto in rapid succession. With Vatican II, the gates opened, and the infiltrated Modernists marched on, in order to occupy all spaces that had been denied to them in the previous decades. The “filial correction” addressed to Pope Francis by more than 60 priests and scholars of the Church, has had an extraordinary impact all over the world. There was no lack of those who tried to minimize the initiative, declaring the number of signatories “to be limited and marginal”. Yet if the initiative is irrelevant, why have its repercussions been so widespread in all the media outlets of the five continents, including countries like Russia and China? Steve Skojec on Onepeterfive reports that research on Google News resulted in more than 5,000 news articles, while there were 100,000 visits on the site www.correctiofilialis.org in a space of 48 hours. The adhesion on this site is still open, even if only some signatures will be made visible. It is essential to acknowledge that the reason for this world-wide echo is one only: the truth can be ignored or repressed, but when it is made manifest with clarity it has its own intrinsic power and is destined to spread by itself. The main enemy of truth is not error, but ambiguity. The cause of the diffusion of errors and heresies in the Church is not due to the strength of these errors, but the culpable silence of those who should openly defend the truth of the Gospel. For our readers in the vicinity of Steubenville, Ohio: I will be giving a lecture on Tuesday, October 3, at 7:00 pm, at St. Peter's Catholic Church. After the Q&A, there will be time for informal conversation and the signing of copies of Noble Beauty, Transcendent Holiness. More information may be found at the website of Una Voce Steubenville, which is hosting the event. "Startup Na Maxa/Start Up With Max" is an initiative aimed at making St. Maximilian Maria Kolbe the patron saint of start-ups and entrepreneurs. Fr. Kolbe was a man whose resourcefulness and perseverance should be a model for all contemporary business people. Even in most difficult circumstances, he showed how important determination, pro-activity, enthusiasm and vision of future handlings are. Therefore it is our desire that entrepreneurs turn to St. Maximilian to invoke his intercession. We associate St. Maximilian Kolbe mainly with his stripped garment and his death as a martyr. But he was also an outstanding businessman who created from scratch some buoyant institutions. We can truly try to imitate him -- he was a man who in his life took all opportunities that were available to him. The initiative "Start Up With Max", together with the Conservative Business Network, is organizing November 12-16 in Rome a retreat for entrepreneurs, startuppers and managers. It was not a coincidence that we chose Rome as a venue for this retreat. Rome was where St. Maximilian studied and it is was where he was also ordained a priest. Moreover, it was where the idea of Miles Immaculatae started -- a magazine that has been published until this day. In the framework of the retreat, we will be visiting the most important places related to the youth of St. Maximilian. We will be reflecting upon his teaching during the Holy Mass, the Way of the Cross and the Holy Rosary. We invite you to deepen your faith by means of participation in our event. A part of the retreat will be delivered by His Eminence Raymond Leo Cardinal Burke. For more information and for application please click here. Primum, denigrate. Saddle the adversary with a label, which will in any case place him in difficulty regarding public opinion as well as put him on the defensive. It is a rhetoric device as old as the world itself and with which the Church is well-acquainted. Thus, faced with an undoubtedly exceptional and exceptionally agonizing event, such as Correctio filialis, signed – at the present moment - by 62 personalities in the Catholic world, both laity and priests (cardinals and bishops, we are told, have been voluntarily excluded) we have two reactions. The first, on the part of those directly concerned, which we will return to, is: silence. The second, by his strongmen, of pen or computer, or the TV, if you prefer, is to: belittle, label in a way as to marginalize, make it understood that they are a poor lot, and (horror of horrors!) right-wing; after all, didn’t Monsignor Fellay the Superior of the Lefebvrians sign ? Another reaction: let’s pray for them, the poor things, who dare to say that the pope can write erroneous things! It’s not possible: it’s the pope himself that defines who is a heretic! How could he write erroneous things? Let’s leave it to those who know more than we do to confute this thesis, which seems to attribute to the pope, always and everywhere, prerogatives which he doesn’t have and which no-one has ever claimed. We note in the articles of criticism, more or less veiled, an element which is rigorously missing: the evaluation whether what is said in the formal correction makes sense or doesn’t. “Let the hour of Prime be suppressed”. So decreed the bishops gathered in Rome in the winter of 1963, at the dead time of the year. Of the 2,147 prelates who voted to suppress, not some local abuse or the apocryphal Acta of an obscure saint, but one of the 8 hours of the divine office, did any, I wonder, feel some slight misgivings? For the Propagation of Heresies"
Update: to add your name (the public list will be moderated, i.e. the authors are looking especially for signatories with academic qualifications etc.) please email info@correctiofilialis.org or go to Change.org to support the petition. 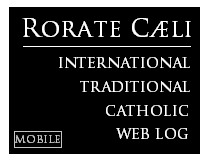 RORATE Note: There will many Catholics, even traditionalists, whose first defeatist reaction will be to belittle this effort. But the wise, the learned in history, will understand that this is just the first part, the first piece of the puzzle, with next steps still to come in a long and extended process. Scandal concerning faith and morals has been given to the Church and to the world by the publication of Amoris laetitia and by other acts through which Your Holiness has sufficiently made clear the scope and purpose of this document. Heresies and other errors have in consequence spread through the Church; for while some bishops and cardinals have continued to defend the divinely revealed truths about marriage, the moral law, and the reception of the sacraments, others have denied these truths, and have received from Your Holiness not rebuke but favour. Those cardinals, by contrast, who have submitted dubia to Your Holiness, in order that by this time-honoured method the truth of the gospel might be easily affirmed, have received no answer but silence. 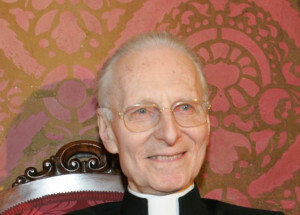 Monsignor Brunero Gherardini, Rest in Peace! Monsignor Brunero Gherardini was a lion in defense of the Catholic Faith, even more so in the last years of his life, when he had to witness so much confusion. His death, on the evening of September 21st, in Rome, was another blow to the small army of defenders of orthodoxy and Tradition in Rome. Monsignor's funeral will take place in his beloved Vatican Basilica on Monday morning. We celebrate this year the 10th anniversary of the motu proprio Summorum Pontificum, a document released by Pope Benedict XVI that liberalized the use of the pre-Vatican II Missal. If we want to know something more about the Extraordinary Form of the Roman Rite (the pre-Vatican II Mass), we could read Noble Beauty, Transcendent Holiness (2017, Angelico Press) by Peter Kwasniewski, a very well known scholar in the field of liturgy. Dr Peter Kwasniewski, choirmaster at the Wyoming Catholic College (USA), certainly presents very strong arguments to defend his position, as can be seen in the following interview. Porfiri: Your book uses the phrase “noble beauty” in its title. How would you describe the noble beauty of the liturgy? Kwasniewski: There are many different kinds of beauty. There is the simple, domestic beauty we associated with well-made furniture, carpets, blankets, plates, and books. There is an austere beauty, such as one might find in the cell of a Carthusian. There is rugged beauty, such as we see in the landscapes of Iceland or Canada or Alaska. But there is a noble beauty that we associate with sovereignty, majesty, occasions of great public solemnity. The liturgy is our courtly audience with the king of heaven and earth. It should be characterized by a tremendous sense of spaciousness, elevation, dignity, and splendor. That is what I am driving at in my title. Porfiri: What is your ideal reader? How you imagine your audience? 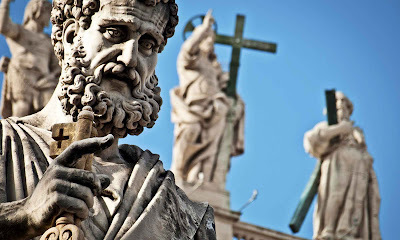 One reader described me as “giving old arguments new juice.” I was born well after the Second Vatican Council ended and after Paul VI had already promulgated a new Mass. All of the traditional things I love are things that almost went extinct. My friends and I had to stumble upon them and discover them anew. I see it with fresh eyes: I have no nostalgic memories. For this reason, my writings seem to speak especially to young people who are in the same boat. This book is largely an “apologia” for the ancient liturgy and the whole world-view it embodies—which is definitely not that of modernity. My ideal reader? Someone who has an open mind to the proposal that the past generations might have had more wisdom than we do. Read the rest at "O Clarim." 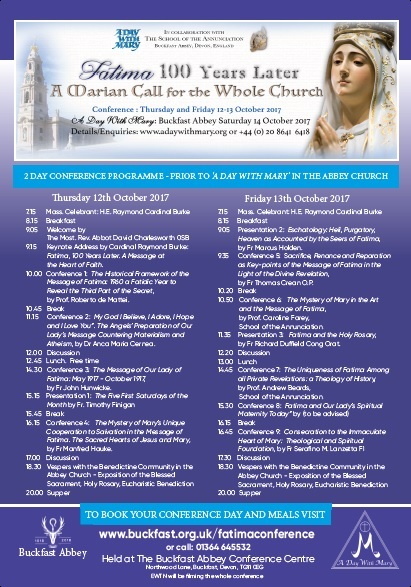 This year the Church is particularly blessed for the celebration of the Centenary of the Fatima apparitions. 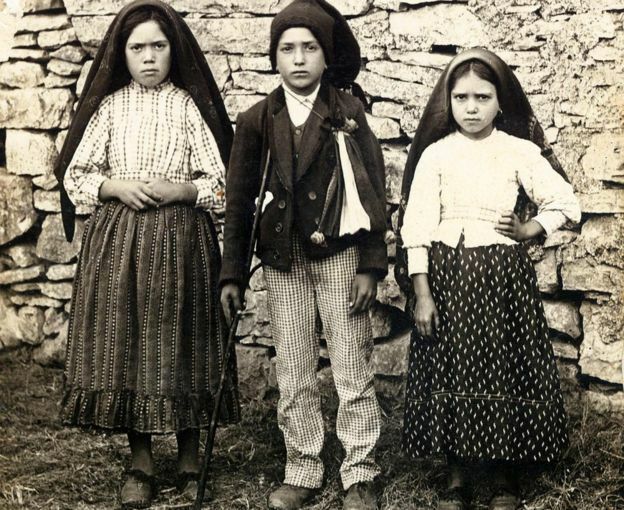 The ‘White Lady’ came to speak – from May to October 1917 on the thirteenth of each month – to three little shepherds, Lucia, Francisco and Jacinta. The last two were canonised last 13th May by Pope Francis, while the process for the canonization of Lucia is progressing. Of all the private revelations approved by the Church, Fatima is one of particular significance give its theological vision of history. Our Lady not only delivered a supernatural message – a call to penance and prayer for rescuing sinners from eternal perdition in hell, but also foretold what would happen if her call were unheeded. As a celestial appeal, Fatima is not something belonging to the past, but a prophecy for the Church today. The Society of Saint Pius X annual pilgrimage to the Shrine of Our Lady at Knock in Co. Mayo was disrupted yesterday, Saturday 16th September, when Shrine officials refused entry to priests and laity. Members of Knock Shrine Security approached the SSPX priests, informing them that they were not permitted to celebrate Mass or carry out any devotions as a group. They confirmed that these were the orders which they had been instructed to convey. 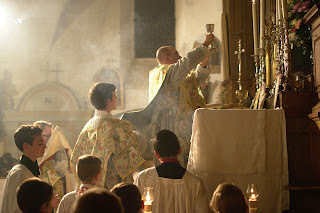 For the first time in over ten years, therefore, the Society was forced to celebrate Mass outside of the Shrine grounds (heretofore, for a number of years, SSPX priests had been granted permission to celebrate Mass in various chapels on the grounds of the Shrine). And, for the first time in the entire history of the SSPX’s presence in Ireland, the pilgrimage group was not even permitted to recite the Rosary or pray the Stations of the Cross within the Shrine precincts! We re-post, for those who are not aware of it, this article first posted by us in 2008. May you all have a fruitful week of sacrifice, remembering our suffering brethren in Mexico and the Caribbean. May the Virgin of Guadalupe, Patroness of Mexico and the Americas, and Saint John the Baptist, Patron of Puerto Rico, intercede for the suffering people of these dear lands in their moment of natural tragedy and suffering. We ask our readers, as much as they can and are spiritually allowed to, to offer up prayers and sacrifices for the souls of the deceased, for their families, for the consolation and healing of the injured, and for those who have lost or will lose their homes and their livelihood. Our friends at Una Voce Des Moines have asked us to let readers know about an upcoming Day of Recollection with Fr. Cassian Folsom, OSB, founder of the Monastery of Norcia, on Saturday, September 30, 2017. His conferences will focus on presenting the structure and spirituality of the Extraordinary Form. The heart of the day will be a Missa Cantata in the Basilica of St. John. UV Des Moines asked that participants RSVP so that they can have a number for preparing food and beverages, as well as photocopies of handouts. 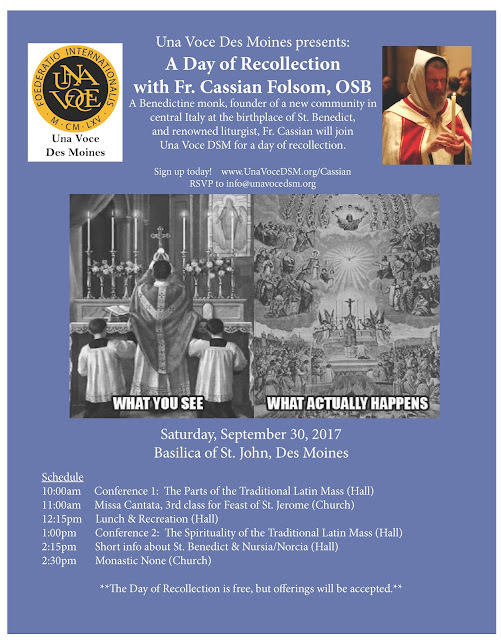 For more information, visit http://unavocedsm.org/cassian/. The churches and basilicas of Rome, including the Vatican Basilica, were filled with pilgrims from all over the world for the 2017 Summorum Pontificum pilgrimage. Congratulations to the organizers and to all involved! 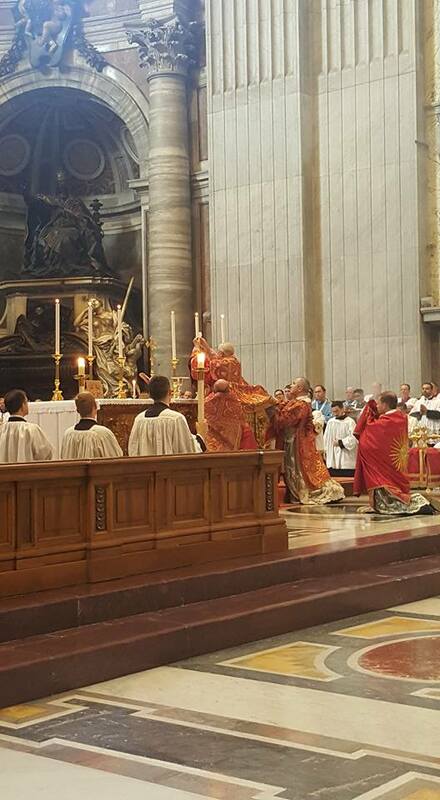 - 2) Pontifical Mass in the Vatican Basilica: 1, 2, 3, 4, 5. 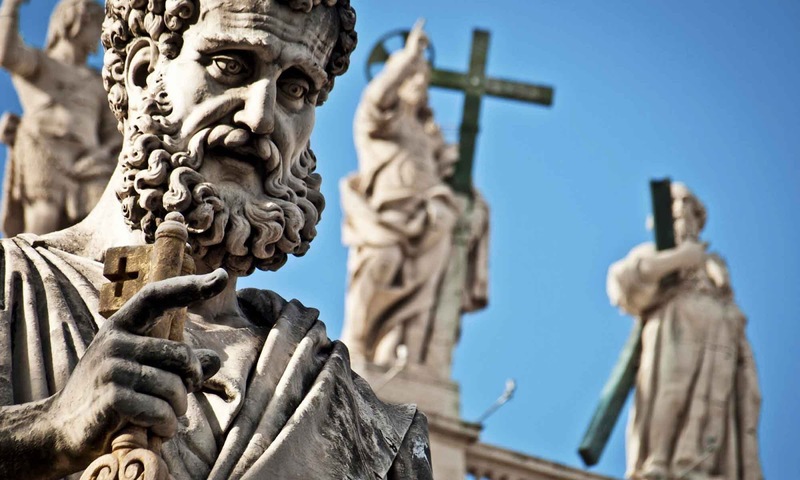 I write this letter to you with a heavy heart full of concern for the Church and for you as the Successor of Peter. We Catholics are called to love you and support you in your difficult ministry in the Church. And we do. But there are many of us who are concerned that you do not have your pulse on the state of the Church as it is in today’s world. You seem sometimes to act arbitrarily on important matters such as the liturgical life of the Church and moral teaching in a way that suggests that you think like someone from the 1960s. While we must respect the Second Vatican Council as an Ecumenical Council, the ways of thinking that were in place at that time are very different from those of the present time. In many ways that Council signaled the end of modernity, at least in the Church. We are called now to try to understand what it means to live in a post-modern age, come to terms with it and then get on with the task of evangelization in a post-modern world. It hurts us deeply when you talk in a disparaging way about those whom you call “traditionalists” and dismiss them as obsessed with the past, narrow minded, and uncharitable. There may be some who fit this image, but those whom I know who love the Sacred Tradition of the Church, far from being obsessed with the past, are vitally concerned with the future of the Church and have no desire to live in a golden age of the Church that never existed. Veritas Bonitas Pulchritas Chicago is a young, enthusiastic group committed to Tradition not based at any parish and that organizes traditional Latin Masses at various parishes, chapels and shrines. They have their own chaplain, acolytes and professional singers. 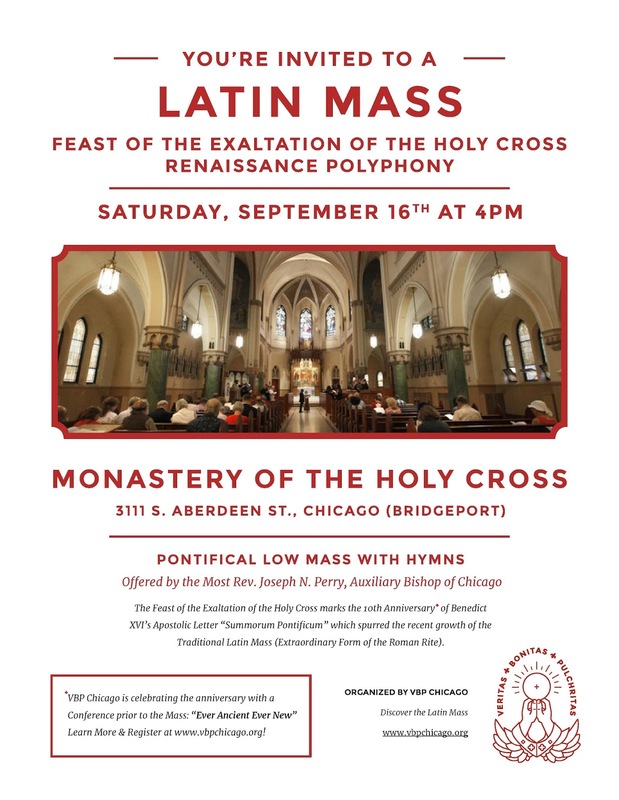 Five of their eight monthly Masses thus far have been at locations where the traditional Mass has not been publicly offered since 1969 -- and each Mass has averaged 100 people. 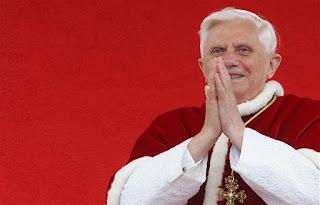 On the 10th anniversary of the entry into force of the motu proprio Summorum Pontificum, we praise the heritage of Pope Benedict XVI, who recognized the grievous injustice of the attempted and impossible abolition of the Apostolic Mass of the Latin Church and freed it from the shackles of lies and of deception. Ad multos annos, Papa Ratzinger! Blessed be God in all things, who hath delivered up the wicked. Therefore whereas we purpose to keep the purification of the temple on the five and twentieth day of the month of Casleu, we thought it necessary to signify it to you: that you also may keep the day of Scenopegia, and the day of the fire, that was given when Nehemiah offered sacrifice, after the temple and the altar was built. For when our fathers were led into [Babylon], the priests that then were worshippers of God took privately the fire from the altar, and hid it in a valley where there was a deep pit without water, and there they kept it safe, so that the place was unknown to all men. But when many years had passed, and it pleased God that Nehemiah should be sent by the king of Persia, he sent some of the posterity of those priests that had hid it, to seek for the fire: and as they told us, they found no fire, but thick water. Then he bade them draw it up, and bring it to him: and the priest Nehemiah commanded the sacrifices that were laid on, to be sprinkled with the same water, both the wood, and the things that were laid upon it. And when this was done, and the time came that the sun shone out, which before was in a cloud, there was a great fire kindled, so that all wondered. And all the priests made prayer, while the sacrifice was consuming, Jonathan beginning, and the rest answering. and preserve thy own portion, and sanctify it. that the Gentiles may know that thou art our God. Punish them that oppress us, and that treat us injuriously with pride. Establish thy people in thy holy place, as Moses hath spoken. And the priests sung hymns till the sacrifice was consumed. 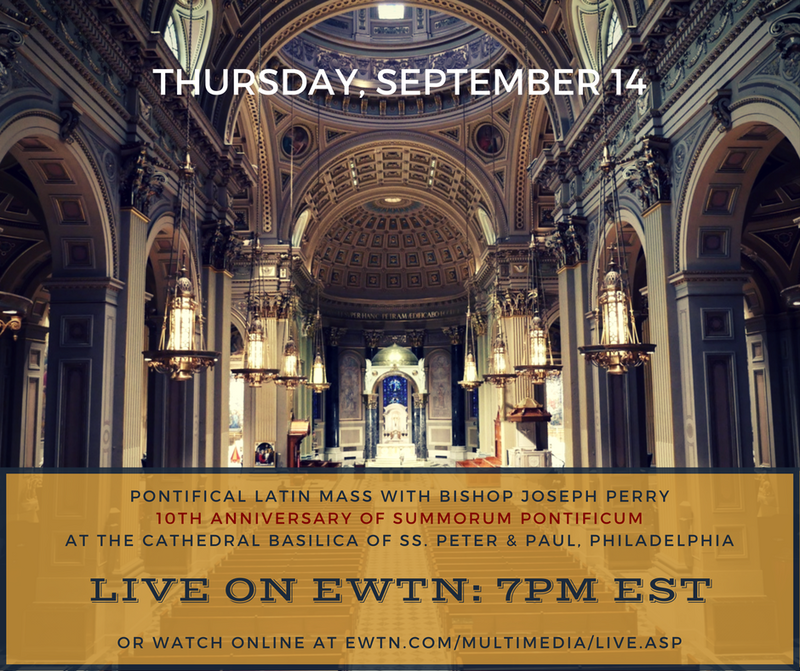 A reminder that EWTN will broadcast live the Pontifical Latin Mass which His Excellency Bishop Joseph Perry will celebrate at the Cathedral Basilica of Ss Peter and Paul in Philadelphia, for the Exaltation of the Holy Cross and the 10th Anniversary of Summorum Pontificum. 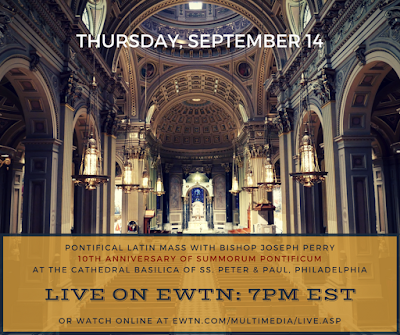 You can also watch on EWTN’s website: http://ewtn.com/multimedia/live.asp; the Mass begins at 7pm EDT. Sacred music for the Mass will include Mozart’s Missa Brevis in C-major, (the “Sparrow” Mass), Elgar’s Ecce Sacerdos Magnus, Monteverdi’s Adoramus te, and John Blow’s Salvator Mundi, in addition to the Gregorian chants. If Cardinal Caffarra’s death on one hand leaves a void for those who grew to love and follow him over the years, on the other hand it calls each and all of us to an even greater responsibility, for our own and the Church’s benefit. For “La Giornata della Bussola”, (on Sunday September 10th) the Cardinal had prepared an intervention and sent it to us just before his death. In these extracts we publish now, we are conscious that it is a sort of spiritual testament and that we are called to continue in this defense of Truth, following the great example of Cardinal Caffarra. Sunday’s lesson is divided into two parts: in the first the Cardinal examines the factors of the destruction of the human and in the second he explains Who it is that rebuilds the human. On the eve of the Turkish siege of Vienna in 1683, the great Augustinian preacher Abraham a Sancta Clara preached a sermon entitled “Arise, Arise, Christians!” urging Austrian Catholics to prepare for the coming battle. Abraham a Sancta Clara, born Johann Ulrich Megerle in Kreenheinstetten near Meßkirch, Swabia, in 1644, as the eigth of ten children, was one of the most colorful and brilliant preachers of the Baroque era. His sermons are full of drastic and amusing images and word play, often he would break into rhyming verse in the middle of a sermon. His sermons are also quite long. According to the custom of the time they were generally preached outside of Mass, and could last over an hour. 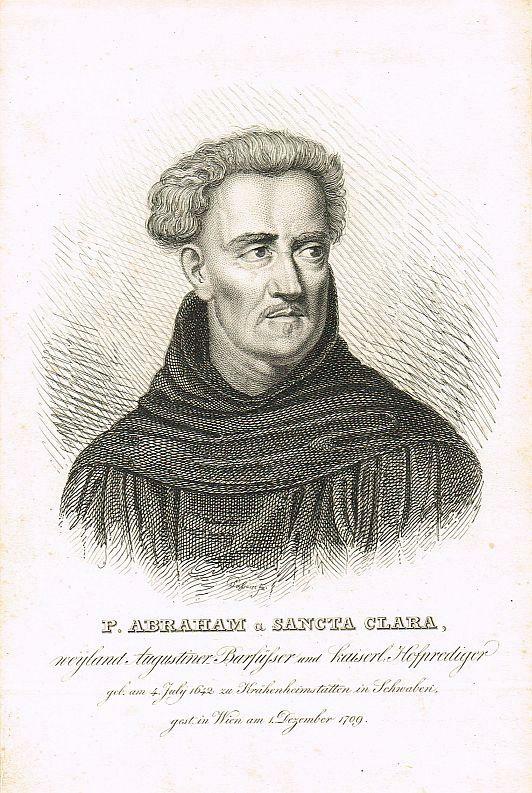 In 1677 Abraham a Sancta Clara was appointed preacher to the imperial court of Vienna. But during the Turkish war itself he was stationed in Graz in Southern Austria. “Arise, Arise, Christians” was published as a pamphlet and distributed in Vienna before the Turks arrived. We present some extracts below in a Rorate translation. 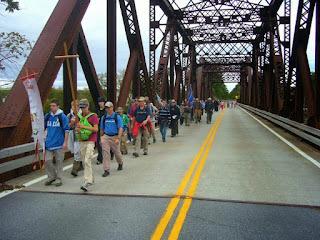 The Pilgrimage for Restoration, a traditional walking pilgrimage, is set to take place this year September 29-October 1. 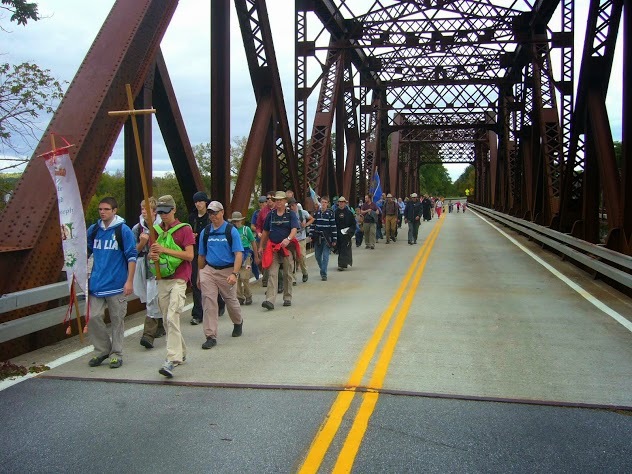 The pilgrimage route goes from the Lake of the Blessed Sacrament at Lake George Village, NY, to the Shrine of the North American Martyrs at Auriesville, NY. In its twenty-second year, the annual pilgrimage is a journey of the faithful to the place in “New France” where Saints Isaac Jogues, René Goupîl, John LaLande and numerous Native American Converts were martyred more than 375 years ago. 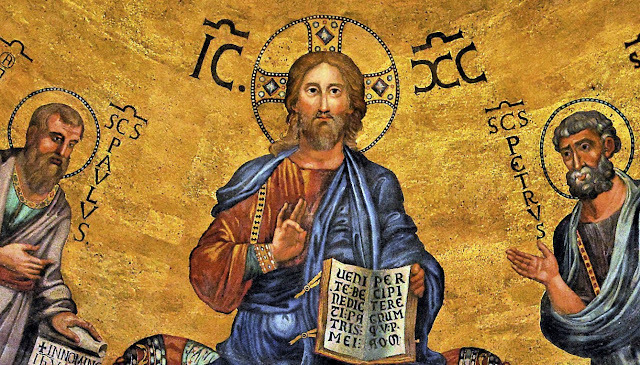 It is conducted in honor of Christ Our King, for the restoration of new Christendom, and in reparation for sins against the Immaculate Heart of Mary. Saint Benedict Center, a traditional Catholic community in New Hampshire, is in urgent need of a priest to fill a six-month position beginning immediately. The community, located in rural southern New Hampshire, includes a small group of religious brothers and sisters, with a stable group of traditional Catholic lay faithful (between 100 and 200 on Sundays). Besides hearing confessions, the chaplain would offer two Sunday Masses (one Low, one Missa Cantata) and daily Mass in addition. The religious run a small school, engage in other youth apostolates, and do some publishing, such as the Catholicism.org web site. The community is located in the Diocese of Manchester, New Hampshire, and priests are granted faculties for their ministry at Saint Benedict Center by Bishop Peter A. Libasci. Private chaplain’s quarters are provided, in addition to meals and a monthly salary. To commemorate the 10th Anniversary of Summorum Pontificum, the Priestly Fraternity of St Peter in Los Angeles has created a video. In spite of not yet having their own church, the video shows the impact that the Mass and the FSSP community has made in the lives of the people of Los Angeles. Q. Whenever you meet young people you always tell them: don't lose hope, the future. President Trump in the United States has abolished the "dreamers" law, which takes away the future for 800,000 kids who illegally entered when they were minors. What do you think about this? 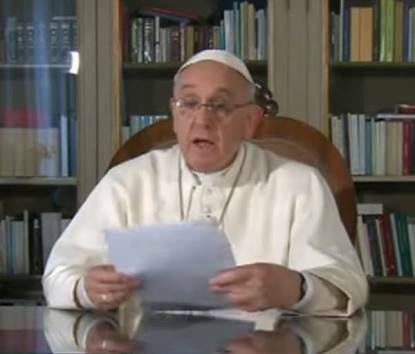 Pope Francis: "I heard about the abolition of this law, but I could not read the articles, about how and why this decision was made. I don't know the situation well. But to separate young people from their families is not something that bears good fruit either for young people or for the family. This law comes from the executive and not from Parliament: if that is the case, I hope that it will be rethought a little. I spoke with the president of the United States, who presents himself as pro-life. If he is a good pro-lifer, he understands the importance of family and of life: the unity of the family must be protected. When young people feel exploited, in the end, they feel hopeless. And what takes it away from them? Drugs, other addictions, suicide, which can happen to someone when they are separated from their roots. Anything that goes against people's roots takes away hope." For the record: C9 Secretary claims that Curia reform proposals to be complete "within a few months". Asked about the progress of the reform, Bishop Semeraro said the reform is more than three quarters done, at least with regard to the work of the Cardinals. 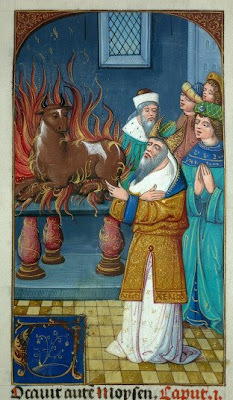 That is, he said, it is almost to the point where the Cardinals are able to present their proposals to the Holy Father. “I think that within a few months this revision will be more or less complete,” he said, and “then the Pope will have at his disposition the proposals that regard all the Dicasteries and I would expect him to decide how and when to actuate them.” He noted that Pope Francis has preferred, up to this point, a more gradual reform, with a kind of “breaking-in” period, which allows for corrections that are inevitably called for as the reform moves from theory to practical reality. The liturgical treasures of the Church are perhaps her greatest and most sublime. These beautiful treasures, from Gregorian chant to vestments to the language of the ancient rite itself, are to be reverenced and preserved, just as the many great saints of antiquity have done before us. 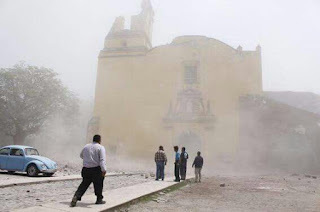 As we are all very well aware, the preservation of the liturgical treasures of the Church has been in decline since the Second Vatican Council, in many, if not most, parishes and dioceses. With Pope Benedict XVI’s Summorum Pontificum, which declared that the ancient rite was never abrogated, we have seen an increase in the celebration of the ancient Roman liturgy—many within the Church have been given the spiritual boldness to preserve this liturgical rite. 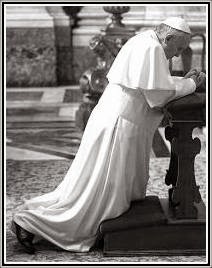 In the tenth anniversary year of Benedict’s Summorum Pontificum, it is worth meditating on why it is important to maintain with reverence and encourage the celebration of the ancient Roman Rite. Namely, if we look to Cardinal Charles Journet’s theological perspective on charity within the Church, we will have a better understanding of why it is necessary to uphold the ancient liturgical traditions of the Church. In his work Theology of the Church (San Francisco: Ignatius Press, 2004), Journet explains that charity is the created soul of the Church; he argues that this soul is cultic, sacramental, and directed (p. 170). For the purposes of this essay, I shall focus on the cultic aspect of charity. 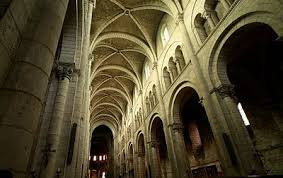 With regards to charity as the soul of the Church, Journet explains, “We can define this soul by saying that it is a charity that is Christic and Christ-conforming, which has come, under the New Law, to full birth” (Ibid.). Through charity, we are fully conformed to Christ, for we are willing to be united to him. To those who would argue against charity as the created soul of the Church, Journet explains that membership in the Church involves two elements: theological faith and the will to remain in the Church (p. 171). For this reason, a sinner is personally deprived of charity, but charity can never be completely absent from the Church herself (Ibid.). As Journet further describes, “Where the charity of Christ is in its fullness, that is, where it is cultic, sacramental, and directed, the soul of the Church is whole; the Church, composed of the just and sinners is in perfect, or complete, act” (p. 172). This is a remarkable statement: the charity of the Church is in perfect act where the liturgy (her cult) and her sacraments are thriving. Charity is not primarily bound up with humanitarian efforts, social justice activities, ecumenism, or any other external activity. Rather, charity and liturgy are intimately linked, as Journet understands it. It is no surprise that difficulties have arisen between the Episcopal Conferences and the Apostolic See in the course of this long passage of work. In order that the decisions of the Council about the use of vernacular languages in the liturgy can also be of value in the future a vigilant and creative collaboration full of reciprocal trust between the Episcopal Conferences and the Dicastery of the Apostolic See that exercises the task of promoting the Scared Liturgy, i.e. the Congregation for Divine Worship and the Discipline of the Sacraments, is absolutely necessary. For this reason, in order that the renewal of the whole liturgical life might continue, it seemed opportune that some principles handed on since the time of the Council should be more clearly reaffirmed and put into practice. Can. 838 - §1. The ordering and guidance of the sacred liturgy depends solely upon the authority of the Church, namely, that of the Apostolic See and, as provided by law, that of the diocesan Bishop. §4. Within the limits of his competence, it belongs to the diocesan Bishop to lay down in the Church entrusted to his care, liturgical regulations which are binding on all. Consequently this is how art. 64 §3 of the Apostolic Constitution Pastor Bonus as well as other laws are to be interpreted, particularly those contained in the liturgical books concerning their revision. Likewise I order that the Congregation for Divine Worship and the Discipline of the Sacraments modify its own “Regulations” on the basis of the new discipline and help the Episcopal Conferences to fulfil their task as well as working to promote ever more the liturgical life of the Latin Church.